Internet in Fernando de Noronha. Nine out of ten best beaches in Brazil are in the tiny island of Fernando de Noronha, but you can't get out of the Internet? Fernando de Noronha is such a place that you will forget to connect to the concrete world outside. The place is all about going the natural way with nothing and no one to disturb you. With so little scope for industrial growth, the island doesn’t have abundant opportunities for upscale communication services. You have to either head to the airport or a government office to avail of internet services. The tourism industry being the only possible and best economy, the government is making every effort to provide all kind of services to tourists, without compromising on the eco-system of the island. Private hotels, inns and government guest houses are cashing in on the development and adding best possible communication services to a host of other existing services. Don’t expect any internet cafes on Fernando de Noronha. A couple of upscale hotels provide internet services straight to your room. Some of the inns too are slowly upgrading their services, like wireless internet connection for tourists. This wireless internet service is slowly spreading to coffee shops within the premises of the hotel, where you can log on to the net. 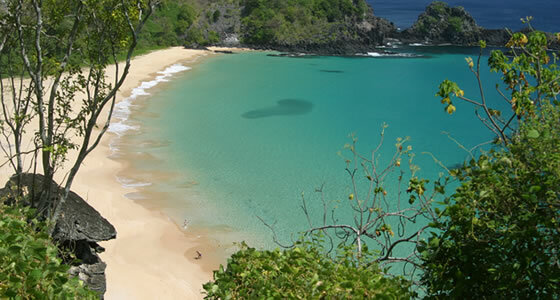 There is so much of adventure and activity Fernando de Noronha offers tourists, that you hardly think of taking time off to get connected to the world outside, unless of course in case of emergency. Edilma restaurant at the Remedios Village, Maritimus Nova and Cia da Lua are some of the places to access the internet.